For the modern context, see graffiti. A graffito (plural "graffiti"), in an archaeological context, is a deliberate mark made by scratching or engraving on a large surface such as a wall. The marks may form an image or writing. The term is not usually used of the engraved decoration on small objects such as bones, which make up a large part of the Art of the Upper Paleolithic, but might be used of the engraved images, usually of animals, that are commonly found in caves, though much less well known than the cave paintings of the same period; often the two are found in the same caves. In archaeology, the term may or may not include the more common modern sense of an "unauthorized" addition to a building or monument. Sgraffito, a decorative technique of partially scratching off a top layer of plaster or some other material to reveal a differently colored material beneath, is also sometimes known as "graffito". Written graffiti, or informal inscriptions. Complex, merged, or multiple category graffiti. Modern knowledge of the history of Ancient Egypt was originally derived from inscriptions, literature, (Books of the Dead), pharaonic historical records, and reliefs, from temple statements, from and numerous individual objects whether pharaonic or for the Egyptian citizenry. Twentieth century developments led to finding less common sources of information indicating the intricacies of the interrelationships of the pharaoh, his appointees, and the citizenry. Three minor sources have helped link the major pieces of interrelationships in Ancient Egypt: ostraca, scarab artifacts, and numerous temple, quarry, etc. sources have helped fill in minor pieces of the complex dealings in Ancient Egypt. The reliefs, and writings with the reliefs, are often supplemented with a graffito, often in hieratic and discovered in locations not commonly seen, like a doorjamb, hallway, entranceway, or the side or reverse of an object. 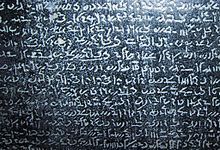 Example of Demotic "Egyptian" script from a Rosetta Stone Replica, 198 BCE. Very Late Egyptian Demotic was used only for ostraca, mummy labels, subscriptions to Greek texts, and graffiti. The last dated example of Egyptian Demotic is from the Temple of Isis at Philae, dated to 11 December 452 CE. See Demotic "Egyptian". For the medieval European reproduction, see Sator Square. The original "Rotas Square" was later made into the 'Sator Square'. The Sator square is a Latin graffito found at numerous sites throughout the Roman Empire (e.g. Pompeii, Dura-Europos) and elsewhere (United Kingdom). It is a palindrome-(theory) which forms a word square that may be read in any direction (with theories). See Sator Arepo Tenet Opera Rotas for alternative details, and Talk:Graffito (archaeology). The reason that the palindrome may only be a theory, is because the square may have to be read boustrophedonically. The square reads: Sator opera tenet; tenet opera sator, and is approximately: "The Great Sower holds in his hand all works; all works the Great Sower holds in his hand." (See: Boustrophedon and the Ceram Ref., pg 30. (Note: reverse direction after the first "tenet", to repeat tenet (then continue boustrophedon). The "Sator Opera Tenet" square as seen in Oppède, France. Pilgrims to religious sites left numerous graffiti at the Egyptian site of Deir el-Bahri. Large quantities of graffiti have been found in Athens during excavations by the American School of Classical Studies at Athens; nearly 850 were catalogued by Mabel Lang in 1976. These include a variety of different types of graffiti, such as abecedaria, kalos inscriptions, insults, marks of ownership, commercial notations, dedications, Christian inscriptions, messages, lists and pictures. They date from the eighth century BC through to the late Roman period. Medieval graffiti is a relatively new area of study with the first full-length work being produced in 1967 by Violet Pritchard. The Norfolk Medieval Graffiti Survey was established in 2010 with the aim of undertaking the first large-scale survey of medieval graffiti in the UK. The survey primarily looks at graffiti dating from the fourteenth to seventeenth centuries. Since 2010 a number of other county based surveys have been set up. These include Kent, Suffolk and Surrey. The examples below are from Saint Nicholas, the parish church of Blakeney. ^ Parkinson, R. Cracking Codes, the Rosetta Stone, and Decipherment, Richard Parkinson, with W. Diffie, M. Fischer, and R.S. Simpson, (University of California Press), c. 1999. Section: page 92, "Graffiti" from a temple at Deir el-Bahri. British Museum pieces, EA 1419, 47962, 47963, 47971. ^ M. Lang, 1976. The Athenian Agora Volume XXI: Graffiti and Dipinti. Princeton: The American School of Classical Studies at Athens. ^ Champion, Matthew (2011). "Walls have ears, noses, ships". Cornerstone. 32 (2): 28–32. Ceram, C.W. The March of Archaeology, C.W. Ceram, translated from the German, Richard and Clara Winston, (Alfred A. Knopf, New York), c 1958. Wikimedia Commons has media related to Ancient graffiti. Chisholm, Hugh, ed. (1911). "Graffito" . Encyclopædia Britannica. 12 (11th ed.). Cambridge University Press. p. 333. "The Graffiti of Pompeii". Edinburgh Review. cx: 411–437. October 1859. Sator Square, inscribed, Article; the article uses: "Rotas square"